Life-time Value (LTV) modeling is common fair for management to determine marketing strategies vis-a-vis the ramifications at every level of customer engagement starting with brand awareness and ending in retention. LTV modeling of big-ticket items puts forth analytic-tactical issues because the sales patterns are "spotty". Even high-generating sales representatives have corresponding arrays of sales with seemingly random months of no sales. The purpose of this article is to outline the approach of LTV modeling of big-ticket items. Analytically, the problem is modeling with monthly-sales variables, which are characterized by large mass of zeros (clearly, not the necessary condition of symmetric data for a good model). I direct with fixed attention the situation, below. To build a model that estimates the next 5 years of LTV (LTV5). The dependent variable is LTV5. The are five years of sales for representatives of big-ticket items. Big-ticket items inply that monthly sales do not occur every month. Actually, arrays of sales are seemingly random months of no sales. Notwithstanding the issue of defining the dependent variable, LTV5, "What technique do modelers use for bulding a LTV5 model with spotty sales?" For my technique, click here. 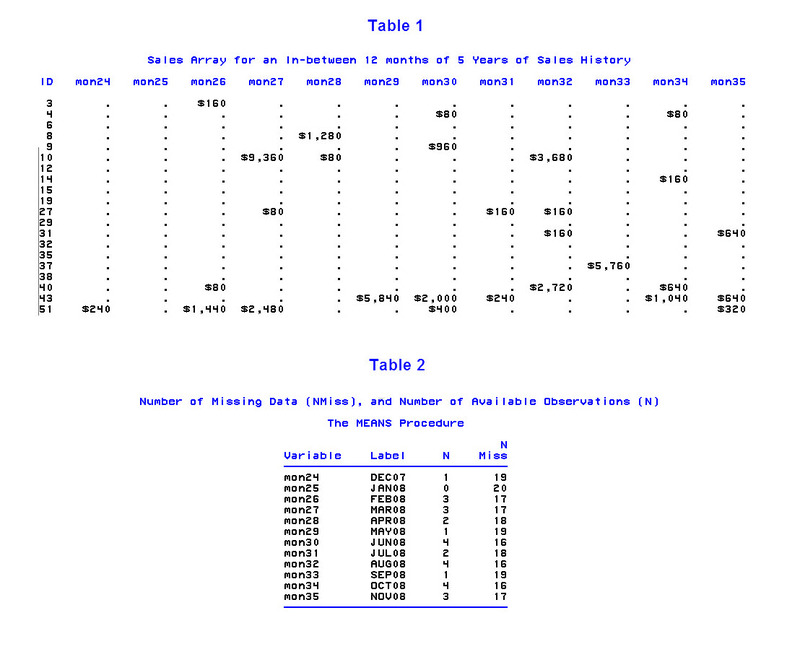 In Table 1, below, I display 20 representatives, and their corresponding arrays of monthly sales, for an in-between 12-month period from DEC., 2007 to NOV., 2008. Table 1, output from SAS©, uses a "." (dot) for missing data, which is $0 for this application. In Table 2, below, I display the number of "missingness" (using SAS proceduce MEANS with the option "NMiss") that indicats the number of $0 sales. Also, I use option "N" that indicates the number of observations available.